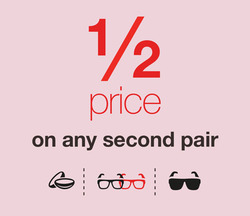 Add Vision Express to your favourites! Add Boots to your favourites! Add Lloyds Pharmacy to your favourites! Add The Perfume Shop to your favourites! Add Savers to your favourites! Both Vision Express glasses and Vision Express contact lenses are always loved by shoppers, making the Vision Express opticians popular in the UK. When customers are looking for details on the current offers and products for sale, it’s great to use the Vision Express store locator function online to find a local store and shop. For extra savings, customers can also look out for any available Vision Express discount code options alongside the seasonal Vision Express offers. Vision Express was first established in 1988. The first major store was opened in the MetroCentre in Gateshead. There are now over 320 stores in the UK. Customers can also benefit from Vision Express tracking with Vision Express online. Do you want to receive more offers from Vision Express by email?